I took my eye off of the clock, and the year is gone! The bambini look taller and older to me. I cleaned closets of the last few days and was amazed at how they had managed to out grow so many clothes! They are wiser, as well, better able to cook, more aware of what needs to be cleaned and willing to help and have a better understanding of our situation. What have we learned? I guess I'm still trying to figure that out...but, 'Not to sweat the small stuff' surely is one thing. The world is pretty much what we make of it, was another. We're in this together - we already knew this, but it became cemented and ingrained in '12. "Tomorrow's another day." as Kim used to tell me. I get it. There is always someone, somewhere, sadder, colder and more alone - someone worse off than us. And, we can't have 365 days of sunshine and temps over 85 degrees. Sadly. Where else to begin? Viro's! The bambini begged me to let them sleep in today, missing Mass - Tonio did not have CCD class this week and I did get them out to the San Xavier Mission on Friday morning for Mass and to light candles for Kim and a good friend in need. It was particularly chilly - and I have gained that Tucson sense of entitlement - I want warm weather and blue skies! The Mission is not heated, we dressed warm, got there at 8:30, and sat huddled together, nearly on each other's laps, watching our breath (yes, it was that cold!) during the Mass. The church looked so beautiful, fully decorated for Christmas, all of the statues of the saints decked out in their holiday finest. Wait a minute, that was Friday...today, we slept in - but I already told you that...We met Angie, Andrea, Lexy and Breanna at Viro's for lunch. The breakfast buffet is no longer. We sure enjoyed it over the last 5 years, but Rosa and Vito are taking a much needed break from the incredibly physical challenge and torrid pace that Sunday's had become. It is a relentless, non-stop cookfest to keep the bakery length buffet stocked with the millions of offerings that Rosa cooked up! She tried to keep the selection above the common garden variety breakfast buffet, cooking Italian, Sicilian, Mexican and American dishes. She always had at least 4 different cakes and pies available for dessert. Vito Jr. did an amazing job over the years whipping up the finest omelet creations (and getting me hooked on his Belgium waffles with chocolate chips and bacon mixed right into the batter!). We'd literally roll out of the bakery after a few hours of power eating, followed by lounging and grazing. Today, we sat at our usual 'big table' and I introduced the prosciutto panini sandwich to the bambini. Before Viro's started the buffet, Kim and I would go to the bakery for lunch, following Mass at St. Francis. We'd almost always share a prosciutto panini. Served on a Sicilian roll, with roasted red peppers, fresh mozz, lettuce, onion, tomato and a balsamic dressing...Autumn and Cody loved it...Tonio, my little meat eater, did not - I think he would have liked just the prosciutto, as he always eats his ham sandwiches with just ham and American cheese - no lettuce, no tomato, no mayo or mustard. He opted for the Italian Wedding soup - Breanna, Lexy and Andrea joined him on this. Lexy likes the Buffalo chicken sandwich they serve and can nearly polish off a whole one - fortunately, for me, she can't quite finish it - so I helped! Andrea noticed that Autumn was wearing one of Kim's blouses and told her how pretty she looked. "Thank you. It was my Mama's" Autumn proudly told her. Although we mourn the buffet's retirement, we rejoice for Rosa and Vito and wish them more peaceful and restful Sundays! Much deserved, I might add. Well, not 'might add', I pretty much just did add that. Deservedly. Again, feeling a sense of urgency, being on the brink of the end of 2012 (and breathing a sigh of relief! ), I worked on making some marinara and meat sauce. Autumn was my little helper in the kitchen today, interested to know about measurements and cooking technique - when do I drop in the onions and garlic? How do I know when to add the tomatoes? I could see her mentally taking notes. She even helped me keep the kitchen clean as we went! Angie, Mark, Andrea, Mario, Lexy and Breanna came over for our last big meal of this year - we made nearly 3lbs of angel hair (Angie, Andrea and my favorite! I always feel like I can eat some much more angel hair than any other type of pasta). The house had been feeling sorta cold over the last few days and it was so good to fill it up and warm it up! The kids laughter filling the living room - Bella seemed to especially like all of the action! We watched the Redskins beat up the Cowboys to win the NFC East in the final game of their season and managed to eat every bit of the meal - pasta, bread and salad - no leftovers! My big failing is still dessert. Even though Tonio and I banged out biscotti and pizzelles for Christmas, I can't seem to get past cooking the meal and making time or plans to have dessert. 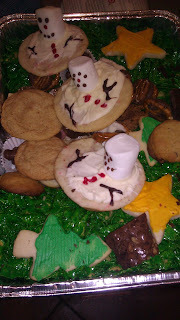 Kim made the cute marshmallow man cookies! There were cut outs, brownies (Angie's! he best! ), fudge, pecan/chocolate/pretzels, snickerdoodles, chocolate covered nut clusters, jelly cookies, lemon bars (Janene made those - they were awesome!) and more arranged on a corn flake wreath!! We passed these around tonight - so my lack of dessert planning was forgiven! The day was a constant reminder of how blessed we are and gave us a great final memory of the year!! Wishing you all good health and plenty of smiles in 2013 - Happy New Year! I couldn't agree more! Tomorrow is another day :) Miss you guys!